I did my first tutorial video. I definitely need to improve some things with lighting and sound but in general I'm pretty happy. If you are an iRealPro user and want better sounding backing tracks instead of the crappy on-board instruments then maybe you can look past my amateurish tutorial! I was totally psyched to have figured out how to get MIDI out of iReal Pro ever since they disabled live MIDI output on the app or AB integration. 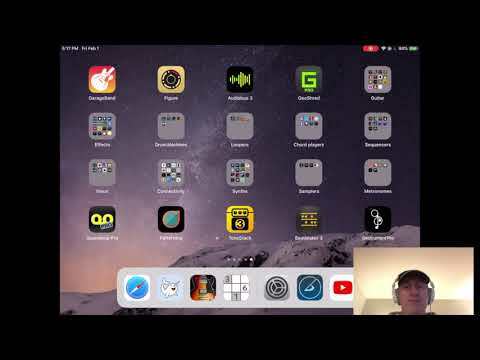 The tips on loading MIDI into GarageBand is worth the watch even if you don't have iReal Pro. There's still a lot of MIDI files out there to quick start a project: drum loops, famous classical compositions (Beethoven's 7th was a bilgy for me to drive iSymphonic purchasing). Your video style is excellent for a trainer. I hope you build a catalog of training. Pick one of the more complex DAW"s and do a series. GarageBand might be a good start. There are jewels there most don't even know about. I did my first tutorial video. Did the drums used in GarageBand line up with those in iReal Pro? I've exported the iReal midi into a bunch of apps and have generally found that I need to transpose the notes of certain drums to different midi notes. I've not done this in GarageBand previously as I believe midi file import is a new feature? Your volume issue definitely sounds like it's fixed due to reading the midi file. Lowering the drums in iReal is likely your best bet. The drums lined up perfectly but interestingly the bass came in several octaves higher in the first measure. I didn't notice this until I started playing around with automation (deleting it) and cutting out the count-in.